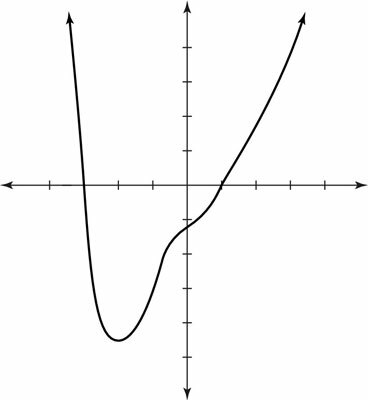 In pre-calculus and in calculus, certain polynomial functions have non-real roots in addition to real roots (and some of the more complicated functions have all imaginary roots). When you must find both, start off by finding the real roots, using techniques such as synthetic division. If you’re lucky, you’re left with a depressed quadratic polynomial to solve that’s unsolvable using real number answers. No fear! You just have to use the quadratic formula, through which you’ll end up with a negative number under the square root sign. Therefore, you express the answer as a complex number. Classify the real roots as positive and negative by using Descartes’s rule of signs. Three changes of sign in the g(x) function reveals you could have three or one positive real root. One change in sign in the g(–x) function reveals that you have one negative real root. Find how many roots are possibly imaginary by using the fundamental theorem of algebra. One real positive root and one real negative root means that two roots aren’t real. Three real positive roots and one real negative root means that all roots are real. List the possible rational roots, using the rational root theorem. Determine the rational roots (if any), using synthetic division. Utilizing the rules of synthetic division, you find that x = 1 is a root and that x = –3 is another root. These roots are the only real ones. Use the quadratic formula to solve the depressed polynomial. Graphing the polynomial g(x) = x4 + x3 – 3x2 + 7x – 6. The preceding figure shows the graph of this function.